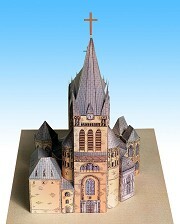 In autumn 2003 the head of the Aachen chapter's press office, Mr. Roland Wenzler, asked me to create a children's papercraft sheet of the cathedral for the Aachen Karlsverein. 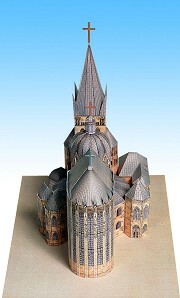 Among many other projects this was meant to financially support the restoration works of the cathedral. 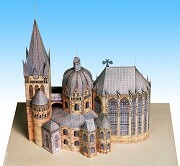 All individual parts of the paper model are placed on six A4 sheets which can easily be sent by post in their red envelope. 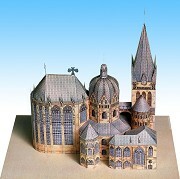 Detailed instructions and a number of photographs are included, as is a solid piece of cardboard which can serve the young and old builders as a ground plate. 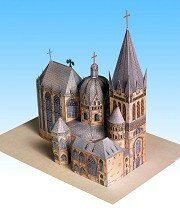 The model is on sale for € 3,50 at the chapter, in the treasury and in the cathedral's gift shop.